KIEV, Ukraine -- Ukrainian President Petro Poroshenko’s national security council has ordered the reinstatement of mandatory conscription in response to what seems to be a full-scale Russian invasion of the country. Russian soldiers sit atop an armored vehicle as they travel near the village of Krasnodarovka in Rostov region, Russia, on Aug. 28, 2014. 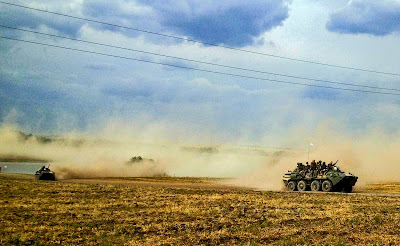 The draft, affecting able-bodied men between the ages of 18 and 25, is the latest indication that the Ukrainian conflict is rapidly intensifying. Previous attempts at mandatory conscription have led to protests. But during a meeting with the council Thursday, Poroshenko urged his countrymen to “keep a cold mind” as Ukrainians geared up for a broader conflict. NATO has provided satellite images that appear to show Russian armored vehicles fighting in Ukrainian territory, CNN reports. British intelligence says it has similar evidence, while U.S. officials say there are now up to 1,000 Russian troops in Ukraine. Novorossiya is the old czarist name for the parts of Russia and Ukraine around the Black Sea and is a designation favored by separatists wishing to confer a historical integrity on the areas for which they are fighting. Responding to the incursions, Western envoys lambasted Russia on Thursday at an emergency meeting of the U.N. Security Council in New York City. Moscow’s U.N. envoy Vitaly Churkin admitted there were Russians fighting in the Ukraine but claimed they were volunteers. He then went on to raise questions about the presence of U.S. military advisers in the country. Reports have meanwhile surfaced that separatist forces have succeeded in opening a third front after seizing the port city of Novoazovsk on the Sea of Azov in the wake of days of shelling. Analysts continue to speculate whether the move is designed to draw troops away from heavy fighting near the separatist strongholds of Donetsk and Luhansk, or is part of a strategic maneuver to forge a corridor to the Russian-controlled Crimean Peninsula farther west. If the evidences of Russian troops fighting in Ukraine, collected by US and Britain is not enough, what in the world the West need, in order to act immediately in providing technical military assistance to Ukraine? 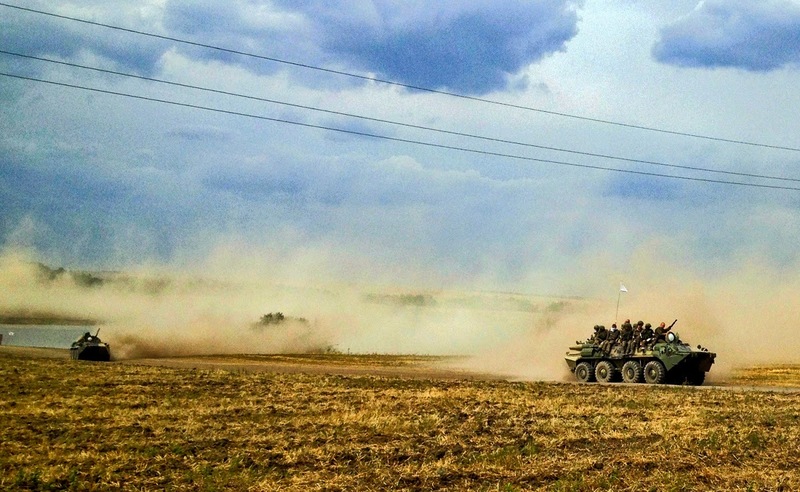 Dragging their feet West is increasing amount of casualties a specially on Ukrainian side. Delay is equal to Death.